The blue-gray antique colonial saltbox at 14 Old Redding Road dates back to 1786 but has all the modern amenities todayÕs lifestyle requires. 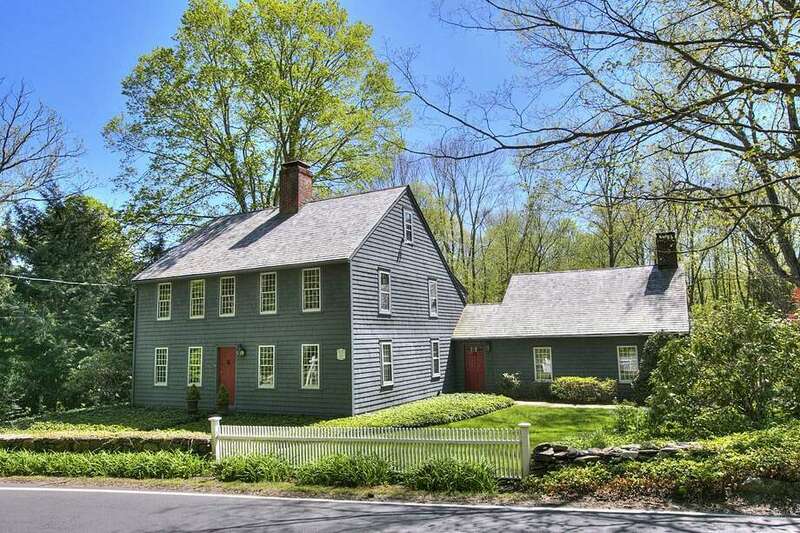 WESTON — It’s hard to believe, looking now at the slate blue-gray antique colonial saltbox at 14 Old Redding Road, that it was stuck in the past for more than 200 years. Only in 1970 did this “jewel in the crown” of Weston’s historic residential inventory get central heat, electricity and plumbing. It was painstakingly improved and maintained by its current owners, who gave it all of today’s modern conveniences and functionality while respecting its historic integrity and charm. Preserved in the process were its very wide-plank chestnut floors, four fireplaces, original hardware, exposed hand-hewn beams, and numerous other 18th century design details, which are all revered by its owners. The house has many doors to two patios and the beautiful backyard featuring lush perennial gardens and mature trees. Those doors are portals to an indoor-outdoor lifestyle. “This property offers something for everyone who appreciates history and yet wants today’s lifestyle,” the agent said. The 3,777-square-foot house was built in 1786. It sits on a level property of two acres, a corner lot along Codfish Lane. In fact, access to the driveway is on Codfish. In 1990, the current owners constructed a post and beam barn on the property, which includes four vehicle bays for use as a garage, and it also contains a large loft space for myriad uses including an artist’s studio or playroom. There is another small barn with a wood stove or piped-in gas heater that could serve as an office. The property is bordered by fieldstone walls, and it is within steps of the Aspetuck Valley Country Club, which offers golf and swimming seasonally, tennis year-round, paddle tennis, and a restaurant. Although the location may seem remote it is actually quite convenient. It takes only five minutes to reach the Merritt Parkway, seven minutes to the Weston Town Center, and less than 10 minutes to Westport and Fairfield shops, restaurants, and train stations. Enter the house from the formal front entrance on Old Redding Road or follow the attractive red brick and slate path to a back entrance. Inside, there are 12 rooms. Many of them feature flooring that is so wide it would be difficult to replace them because the width requires old-growth wood. The next owner may come in and paint every room in white and monochromatic gray but as it is currently designed the house contains colors appropriate to its provenance. The kitchen cabinetry is adorned in a colonial blue. Colonial red is found in the parlor. In what may have been the original kitchen, now a living room or parlor, there is a huge red brick fireplace with a bread oven. In the formal dining room there is a built-in corner china cabinet and a brick fireplace with a decorative wood mantel and a parson’s cabinet above it. A library or office has a wall of floor-to-ceiling bookshelves. The family room is quite large and features a wet bar, fireplace, built-in shelving, and French doors to the patios and yard. There is also a den with a fireplace above which there are three cabinets. The spacious kitchen may be painted in a color reminiscent of Revolutionary times but its amenities are those of the 21st century. It has a large center island that doubles as a breakfast bar for three or four, a double porcelain sink, a backsplash of white ceramic tile - some with decorative detailing, wood counters, walk-in pantry, an eat-in area, and French doors to the patios and yard. Installed in the island is a GE Monogram five-burner cooktop, and there is a Sub-Zero refrigerator. On the second floor the master suite is quite spacious, particularly for a house of this vintage. It has wall-to-wall carpeting, a sitting area, two closets, and a private bath with a wall of built-in storage cabinets. There are three other bedrooms in this house and many nooks and crannies, which makes it worth exploring, and that is possible on Saturday (July 14), when there will be an open house from 1 to 3 pm. For more information or to make an appointment to see the house contact Laurie Morris of KMS Partners/Coldwell Banker Residential Brokerage at 203-247-3140 or lauriemorris1123@gmail.com.